The Ritz-Carlton, Dove Mountain has added nine one-of-a-kind adventures to its popular recreation program, with a focus on authentic southwestern experiences. From late-evening hunts for fluorescent scorpions, to family movie-making and an intriguing Ridge and Ruin discovery tour, the new activities take spectacular advantage of the property’s 850-acre high Sonoran Desert setting and of southern Arizona’s richly diverse cowboy, Native American and Mexican heritage. Several of the resort’s new activities make use of modern technological tools, as well as photo/video apps, and hotel adaptations of the area’s terrestrial and astronomical marvels. One memorable offering even converts a guest room ceiling into a virtual planetarium, allowing guests to sleep “under the Arizona stars” — perhaps after an evening of real outdoor stargazing. Another first-ever experience is the resort’s Ancient Rock Art Tour, providing resort guests with an authentic sense of place and cultural stewardship, as they explore rock formations surrounding the property and ancient petroglyphs etched into these formations by the region’s legendary, lost Hohokam people. Did you know that scorpions are fluorescent if observed under a black light? They also tend to venture out on balmy summer evenings, when it’s warm and comfortable under the moon and stars. The resort’s Ritz Kids Rangers have located some of these critters’ favorite haunts in nearby terrain, and they now offer regular guided tours to let guests see shining examples of this natural desert nightlife. This treasured excursion allows guests to examine Hohokam and archaic tribal sites, which contain etched rock imagery and morteros (grinding holes) where the region’s early inhabitants prepared their meals. This hike takes place in well-known and secret locations where the “ancient ones” once lived. For children exhausted by a day of Ritz Kids adventures or a few hours at the resort’s 235-foot water slide and splash pad — or for adults fascinated by the area’s famously starry skies and astronomical institutions, The Ritz-Carlton takes its outdoor stargazing program indoors, projecting the southwestern sky onto a guest room ceiling in planetarium style. Sleeping under the Stars also includes comfy sleeping bag accommodations, a children’s book about the stars, astronomy book and use of a star projector. Also indoors, children can enjoy the resort’s beloved In-Room Camping experience, with a luxuriously outfitted junior-sized tent placed inside the room so that they can forego beds in order to sleep in under canvas, Wild West-style (minus the dirt and hard ground). This four-mile hike visits the legendary upper reaches of Alamo Ridge in the Tortolita Mountain range, which is rich in Saguaro cactus and considered the “back door” of Dove Mountain. The tour then descends into Wild Burro Canyon to explore the historic ruins of the T-Bench-Bar-Ranch. One of the main trailheads into this important hiking zone originates directly at The Ritz-Carlton and is popular among accomplished outdoor enthusiasts. For lovers of desert flora, this 3.5 mile walking excursion visits magnificent giant Saguaro cacti, some of them up to 100 years old. It also takes in a multitude of other cactus varieties along the scenic Upper and Lower Javelina Trails, making for a photographer’s dream walk. Resort guests are invited to enjoy their own hikes with complimentary use of advanced hand-held GPS units featuring property coordinates pre-programmed into each device. GPS technology is also used for best-selling geocaching activities at The Ritz-Carlton, and by the resort’s expert Dove Mountain Rangers, who provide regional hiking and safety assistance to outdoor enthusiasts drawn to the majestic terrain of southern Arizona. A memorable way to welcome the southwestern sunrise, this peaceful excursion takes early risers through back canyons and covers 1.5 tranquil miles. Participants enjoy beautiful panoramas of the Tortolita Mountains, resort grounds and greater Tucson. This gentle hour’s walk climbs to a rock ledge at the resort, a perfect place to view a stunning Tucson sunset. The resort also offers other walks, sunrise and day hikes, bike rides, four-wheel drive excursions and horseback trail rides, from beginner- to expert-level, available throughout the surrounding desert and foothills. Recently awarded the first Forbes Five Star hotel rating for Southern Arizona, The Ritz-Carlton, Dove Mountain is celebrating its new rating and clear starlit skies with the Sonoran Stars package — featuring luxury accommodations, use of a professional reflector telescope on the guest room terrace or balcony, a detailed star map and Chocolate Stars turndown amenity. 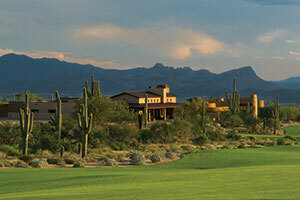 Reservations may be made by calling 1-800-241-3333 or online at http://www.ritzcarlton.com/dovemountain.